One of the best features of the Apple iOS platform is AirPlay. 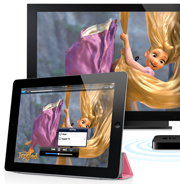 AirPlay makes it simple to wirelessly stream audio and video content from an iPhone or iPad to an AirPlay-compatible device. AirPlay is great, but it could be even better if it were available in more situations. There are plenty of rumors circulating about some sort of Apple iTV. Perhaps it will even have some Siri voice control capabilities. But, as long as it has AirPlay functionality built in, I will definitely take a look at it. Currently I use Apple TV, which accomplishes the same thing, more or less, using an external module. But, it would be nice if TVs just had AirPlay built in for situations where I might want to stream content from my iPhone or iPad while visiting friends or family. This actually exists already. I have my eye on a Pioneer VSX-1021 surround sound receiver which has AirPlay built right in. This receiver is not the only one available, but it’s the one on my wish list. Using the AirPlay feature, you can play music from an iPhone or iPad wirelessly to your home stereo. The receiver is a home theater type setup – with HDMI ports for routing video signals as well. It would be cool if it could also do AirPlay on the video side for sharing content or watching movies from an iPhone or iPad as well. Many cars come equipped with audio-in jacks that you can connect to the headphone output of an iPhone. Some vehicles even have docking ports specifically designed for the iPhone. However, it would be even better if I could just stream the music of my choosing from my iPhone or iPad to my car stereo via AirPlay. My minivan has an in-dash DVD player and dropdown display so my kids can watch movies during road trips. But, the movies my kids want to watch are frequently not in the car, or the DVD is so scratched up that its useless. I’d like to be able to just flip down the display, and seamlessly stream content from my iPhone or iPad via AirPlay. It would also make it easier to get new content if they run out of things to watch. There you have it. I am sure there are other creative ways that AirPlay could be put to good use. If you have any suggestions, feel free to share them in the comments. As an AirPlay aside, the $99 Apple TV can be a great tool for mobile users. It is relatively compact, and can be easily connected to via HDMI to a projector, monitor, or TV for sharing content, or conducting presentations from an iPhone or iPad. If you happen to stay in a hotel nice enough to have a TV with HDMI (or you also carry around the necessary wiring and gadgetry to connect HDMI to standard RCA jacks), you can hook it up so you can rent movies or TV shows from iTunes, surf YouTube, or watch Netflix on the TV instead of being confined to the smaller display on your iPad or laptop.